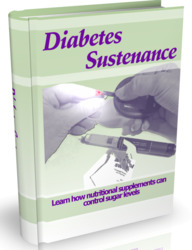 Obtain a history of any visual changes from diabetic patients. On examination, low visual acuity and the presence of visual field defects should arouse suspicion for retinopathy. 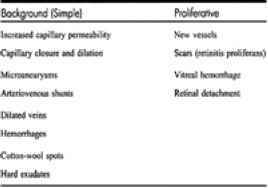 Dilated funduscopy is often not practical in the emergency department, but a nondilated retinal exam can frequently reveal "cotton wool" exudates, microaneurysms, and vascular proliferation consistent with diabetic retinopathy ( Table... .2.0.9-6.). A red and/or painful eye in association with headache or simply unexplained headache in diabetics should prompt measurement of intracocular pressures to rule out acute glaucoma. The presence of these findings should prompt a referral to an ophthalmologist for further examination and therapy.